These photographs first appeared July 20, 2000. The "yachtie" look of Boston Whaler boats has always been part of their appeal. 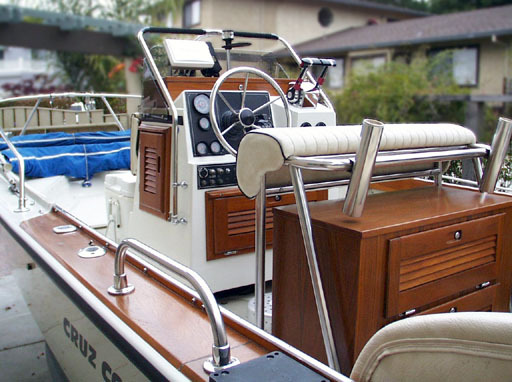 It comes from the combination of purposeful hardware, like stainless steel mooring bits and rails, and well crafted wood trim and components. Dan Firth's 1983 Outrage 18 is a great example. 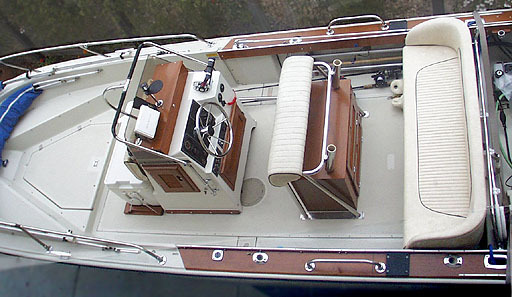 This overhead view shows the some of options that were available for the interior of the versatile Outrage series. This boat has the Leaning Post seat at the pilot console, and the full width Stern Seat. Up front is the cooler seat, and there are some additional upholstered cushions available (not shown) for the forward seats. Also in view are the Mills & Co. Forward Shelter and Flying Top, both of which fold and stow in the forward cockpit, nicely out of the way. The Windshield and the Mooring Cover are also part of canvas for this boat. Out of view on the transom are two 1986 Evinrude outboards, a 120 HP and a 25 HP. To get all the wood looking this good, restorer Dan Firth used Cetol Marine, which gave the teak the dark rich color you see here. 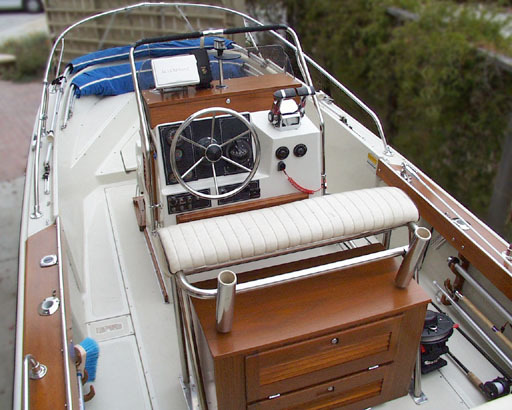 On the console top, a teak lockable electronics box has been added. And under the Leaning Post seat, a great creation of Dan's own design, a teak tackle cabinet is installed. A cabinetmaker friend built it and Dan finished it. The boat's name has an extra mirth when you learn that its home port is Santa Cruz, California, where Monterey Bay is the favorite fishing spot. Under the gunwales are new teak rod racks, which often hold fly fishing gear when heading for inland lakes in Northern California or the Sacramento Delta. The open cockpit of the Outrage provides room for three fly casters at a time. Dan says, "I'm the second owner, and this is my second whaler. I fixed up this boat as if it were my last one." A very nice job done on this, Dan confesses he's looking for a 22-Outrage with Whaler Drive for his next boat!